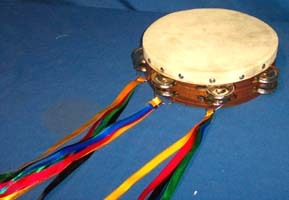 I have found absolutely beautiful hand-made tambourines with goat-skin membrane and wooden frames - at a reasonable price! All tambourines have a double-row of jingles and make a wonderful, acoustical sound to praise and worship the Lord with. They are also AWESOME for warfare! The rosewood frames are cherry in color and have a little more weight to them, and the willowwood is maple in color. Quantities and selections are limited, but more are due in soon! If you're looking for something practical, we now carry cases for your tambourine. 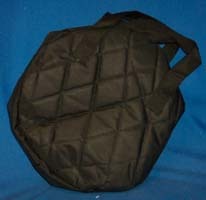 They are black and have two handles for carrying, and a zipper to safely store, protect, and transport your tambourine. They fit all 8" and 10" sizes. When the dancer has the knowledge of the scriptural meanings behind the color combinations of the 'props' they are using, it brings them power in the spiritural realm which provides foe-defeating power in the Holy Spirit. Each tassel is packaged with the scripture significance information included and is made of high-quality satin ribbon (gold & silver are metallic ribbon). They may be used for tambourines, creating an beautiful effect when swirled over the head (which is an awesome weapon for warfare when coupled with the knowledge of the word of God), around your fingers with interpretive dance, or on a small 'wave shaker' stick adding color and scriptural significance to your praise & worship. Please feel free to suggest any combinations for scriptures the Lord has placed on your heart. Available tassel lengths are 8" or 16"
"Present your bodies a living and holy sacrifice, acceptable to God, which is your spiritual service of worship." "For He is like a refiner's fire... And He will sit as a smelter and purifier of silver, and He will purity the sons of Levi and refine them like gold and silver, so that they may present to the Lord offerings in righteousness." "He who is the blessed and only Sovereign, the King of kings and Lord of lords; who alone possesses immortality and dwells in unapproachable light; whom no man has seen or can see. To Him be honor and eternal dominion!" Worship the Lord in spirit thru His word! 8" Scripture Tassel - $6.95/ea. 16" Scripture Tassel - $7.95/ea.